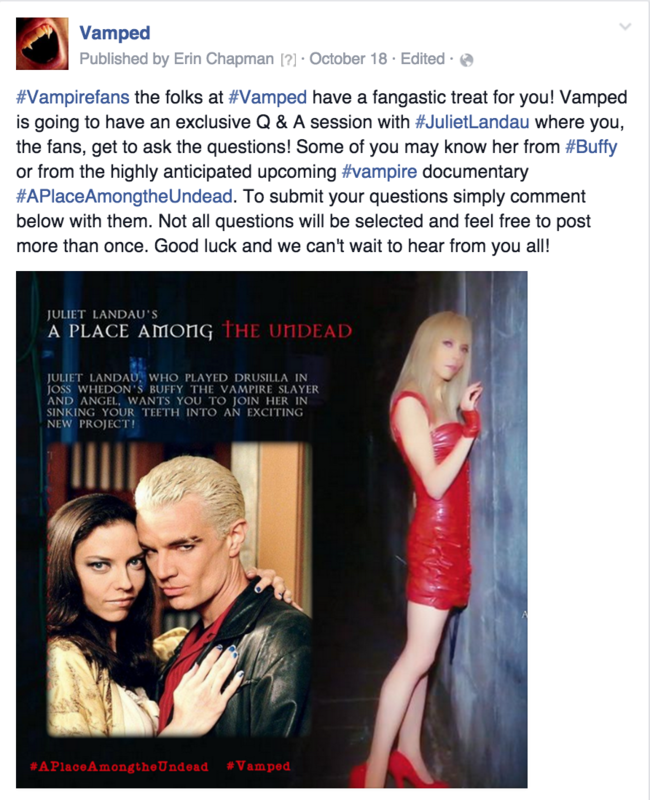 On Thursday Nov. 19 at 7 p.m. PST, Juliet Landau, director and producer of upcoming crowdfunded vampire documentary A Place Among the Undead (APATU) due to be released in October 2016, conducted an exclusive live fan Q & A for Vamped. The idea came about on Oct. 14, 2015 when Deverill Weekes, Juliet’s husband and APATU’s co-director; Anthony and I were having a three-way conversation on Facebook brainstorming some unique ways that Vamped could work with the APATU team to help promote their project. The three of us agreed on a fan-generated Q & A. To acquire the fan questions, I posted on our Facebook page asking for submissions and shared the post on our groups, pages and other ones we have access to. We received fifty-three questions from fans. Anthony and I had to decide on a criteria to cull the list down to an amount that wouldn’t take Juliet hours to answer. We narrowed down the questions to twenty-one. We decided to cull questions asked more than once; we used a first come first serve basis to narrow those down. We also aimed for questions that enabled Juliet to dig into the human side of things, to give the fans a unique experience they wouldn’t find on other media sites. The next step was the formatting: we fixed typos, alignment, spacing, and condensed the questions as some people mixed theirs with comments too. The final stage was to reorder the questions to “tell a story,” as Anthony likes to call it. For this step he put my editing skills to the test and made me work on it while he supervised. Once we were happy with the final product, I sent the file off to Deverill. The broadcast was originally scheduled for Friday, Nov. 13 at 7pm PST, but due to the terrorist attacks on Paris, the event was rescheduled shortly before it was due to go to air. I had been at work all day and actually had no knowledge of the attacks till Deverill messaged me while I was checking my Facebook news feed. The Q & A finally on Thursday Nov. 19 at 7 p.m. PST. Anthony and I watched part of it live, as Deverill read our fan-submitted questions out loud to Juliet, while we were on the phone with each other. We were very impressed with how personable Juliet was with her answers and the stories from her life that were emerging. Later that night, Deverill messaged me asking if Vamped wanted to go for round two so I am currently in the process of collecting questions for the next fan interview. The broadcast date is yet to be determined. If you have a fan question you would like to ask Juliet, you can submit it in the comments section of this article or post it our Vamped Facebook page. Make sure to check out the APATU Indiegogo Campaign. There are lots of perks left and what better way to spend your money than becoming a member of the undead? 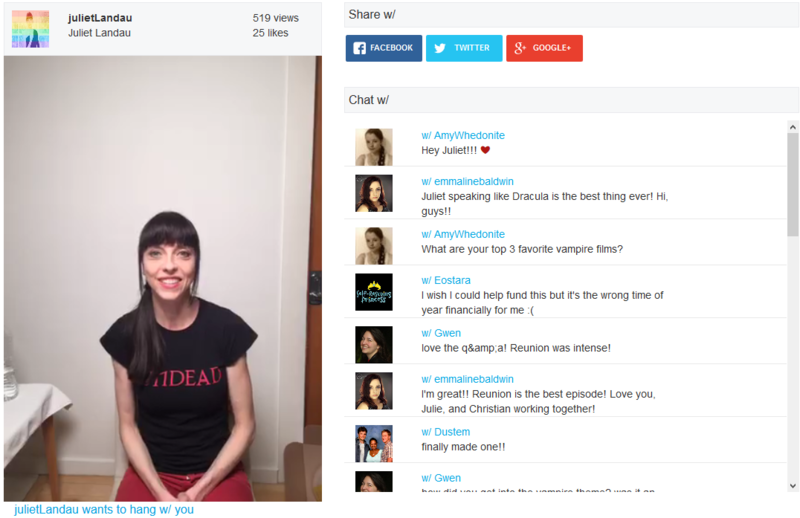 an exclusive live fan Q & A for Vamped: julietLandau [Juliet Landau], “julietLandau wants to hang w/ you,” Hang w/, 2015, accessed Nov. 23, 2015, https://www.hangwith.com/user/julietLandau/564e8e21e4b01353f448c459. archive.is link: https://archive.is/Czh9D. on Hang /W: “Questions?,” Hang /w, accessed Nov. 21, 2015, http://www.hangwith.com/faq. archive is. link: https://archive.is/Ib2BZ. Indiegogo Campaign: “A Place Among the Undead,” Indiegogo, accessed Nov. 21, 2015, https://www.indiegogo.com/projects/a-place-among-the-undead#/. archive.is link: https://archive.is/AJagp. Erin Chapman, “Interview with Juliet Landau, Director of ‘A Place Among the Undead,’ “ Vamped, Oct. 28, 2015, http://vamped.org/2015/10/28/interview-with-juliet-landau-director/. An in-depth interview with Juliet Landau that covers her past, present and future. Draft questions for Juliet (pdf). Collation of questions received for the Hang w/ interview from various Facebook posts. “Questions for Juliet Landau: Hang /w Interview for Vamped” (pdf). Final draft of questions chosen from the draft, submitted for the Hang w/ Q & A session. Next article Gaga for Blood: Is AHS: Hotel’s Countess a Real Life Blood-Drinker?